Branson Ticket & Travel - A packed lineup of festivals at Silver Dollar City for 2013. 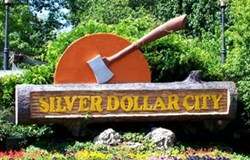 Branson Ticket & Travel - Silver Dollar City has some of the most unique, entertaining and accessible music, arts, lifestyle, holiday and food festivals anywhere in the world and all in one place. To purchase 2 day tickets for the price of 1 Click Here or call 1-800-432-4202. Thrills get bigger than ever with Outlaw Run! The new $10 million ride, the only wood coaster to twist upside down three times, the world’s steepest wood coaster, and the second fastest wood coaster in the world, leads the excitement with the park’s more than 30 rides. Chris Perondi’s Stunt Dog Experience, featuring canine all-stars soaring, climbing, jumping and performing. Wacky Science with David Willey, featured on the Tonight Show with Jay Leno. Cartoon Character Meet & Greets with kid-favorite cartoon superstars. Ride into the night with extended time on over 30 rides and attractions including the new Outlaw Run. Nightly Street Dances on the park Square. Southern Gospel Nights Concerts each evening. Mouthwatering picnic-style foods including the park’s famous chicken. NEW: The Texas Trick Riders perform in a special showcase of tricks and stunt riding, presented through October 6. Western Stunt Show features professional stunt men and women performing amazing feats in a light-hearted, Western-themed presentation. It has over 125 visiting craftsmen from around the country demonstrating their art in the nation’s largest festival of artisans and craftsmen. Two original musical productions: It’s a Wonderful Life, adapted from the Frank Capra classic, and the acclaimed production A Dickens’ Christmas Carol. The Christmas on Main Street light & sound show featuring the 5-Story Special Effects Christmas Tree. The colorful Holiday Light Parade, a musical Living Nativity and holiday shows. 4 million lights, rides, shopping and Silver Dollar City legendary dining. To request information or a Free Showguide & Vacation Planner Click Here.